Color Available: Light Blue, Navy Blue, Red etc. We are engaged in offering the high-quality range of Certificate Display Files to our esteemed customers. 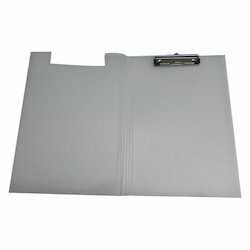 Info mate Magnetic Folders is a durable pocket folder for single document display. We have in our store an exclusive range of Display Files. The offered display files are provided to customers in various sizes and designs at market leading prices. Furthermore, our offered products are made using quality-approved material, which is obtained from the certified vendors of the market. We are a leading name in manufacturing display files which are long lasting in performance. Their cost effectiveness is an added advantage. Having aesthetic appeal, these are widely demanded among people. We assure that we meet with all the leading quality standards and parameters assure that our display files are premium quality. We are a leading name in trading display files which are long lasting in performance. Their cost effectiveness is an added advantage. Having aesthetic appeal, these are widely demanded among people. We assure that we meet with all the leading quality standards and parameters assure that our display files are premium quality. With our years of experience & in-depth knowledge in this field, we are engaged in offering a quality-assured array of Display File. - Available in 10/20/30 Leafs with Box Pack. - High Qulity Finish Material.